Al Capone, public enemy No. 1 and the most powerful gangster of the Prohibition era, spent the last years of his life in seclusion at his house in Florida. He fished from his boat, doted on his grandchildren, dined on his wife Mae’s spaghetti — and had imaginary conversations with long-dead mobsters, some of who, he’d had killed. His brain ravaged by a syphilis infection that had gone untreated, he had the mental capacity of a 12-year-old. The man who once ruled the Chicago Outfit, a multimillion-dollar bootlegging and racketeering empire that spanned North America, was just happy to be taken to the drugstore to buy a pack of Dentyne gum. The gangster’s last years are detailed in Deirdre Bair’s new biography, “Al Capone: His Life, Legacy, and Legend.” Bair drew on interviews with Capone’s grandchildren and other relatives, most of whom preferred to remain anonymous, to dispel many of the myths that have long swirled around Al “Scarface” Capone. 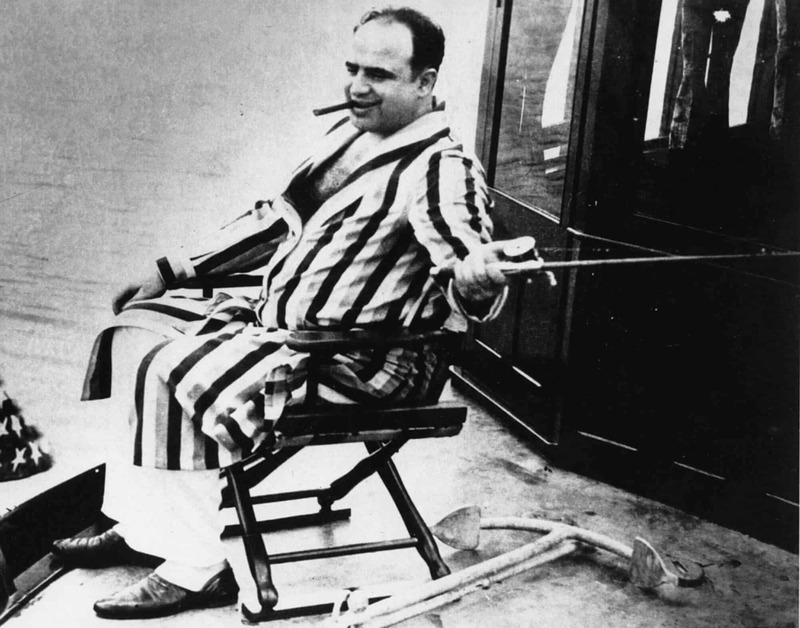 One example: Capone had his huge swimming pool stocked with fish and spent his afternoons in his pajamas catching them. Though widely reported at the time, the story is false. There were no fish in the pool, but Capone enjoyed walking around his property with his granddaughters, looking for butterflies. That’s partly because Capone was broke, Bair reports. In the 1920s, his yearly income was estimated at $40 million. But he ran the Outfit for only six years. He spent most of the 1930s in jail for tax evasion. When he was released in 1940, the Outfit gave him a salary of $600 a week, hardly enough to support his family, house and staff. The swimming pool at the former home of Al Capone. Newspaper reports that Capone secretly controlled the Outfit from behind the walls of his Palm Island compound may have originated from the occasional flashes he had of his glory years, as well as those imaginary conversations he had with old cronies. Reporters camped outside the gates of his house and turned any scrap of gossip into a headline. Mae, Capone’s wife, probably saved his life by keeping him isolated. “She knew that it was dangerous for him to go out in public,” Bair says. An angry public outburst, caused by his syphilis-addled mind, would have been fraught with peril. If the Outfit got wind he was nattering on about old business, he was a dead man. And if a judge heard Capone was violent, he could have been confined to a mental home. Capone died in bed on the morning of Jan. 25, 1947. The cause was bronchial pneumonia. His death made front pages around the world, but the funeral was a modest affair, Bair writes, because the Outfit allowed only a few of Capone’s old friends to attend. Mae clung to the Palm Island house until 1952, when reduced circumstances forced her to sell it. It sold two years ago for $7.4 million and can now be rented for film shoots or private functions. Mae died at 89 in 1986. Not long before her death, she put a match to her diaries and the love letters Capone sent her from prison.